With an increasing demand for plant-based meals at colleges across the nation, and even more elite athletes swearing by the performance benefits of a vegan diet, Donald Trump’s recent fast-food lunch offering to members of the Clemson Tigers shows just how out of touch he really is. This is why, weeks after a government shutdown he initiated after Democratic leaders wouldn’t agree to help fund his $5 billion border wall, it wasn’t all that strange that South Carolina’s football champions, the Clemson Tigers, were fêted at the White House with an assortment of fast food, clashingly arranged on silver trays next to ornate, gold-plated candelabras and the president standing behind the table, positioned under Abraham Lincoln’s portrait, with a wide grin and confusing body language. So, yes, it was unusual, but it really wasn’t that strange given our new normal. After all, this is Trump’s favorite, er, food, and the shutdown has affected the White House staffing as well, including the kitchen. It was the tweet, though, that really seemed to get a big response. 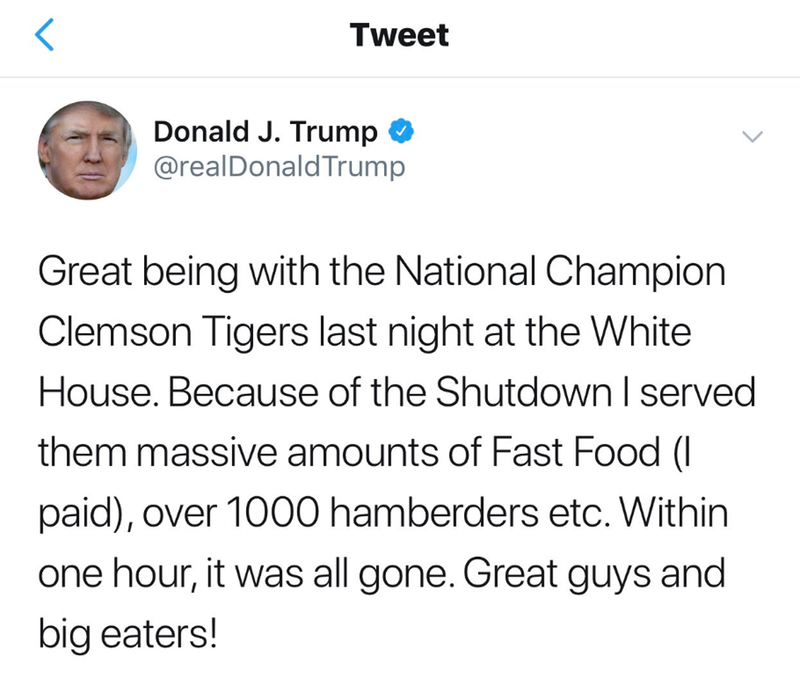 Trump is no stranger to the odd misspelling (while it was “unpresidented,” I can’t include covfefe as one because it remains a head-scratcher), so “hamberder” seems like a strange thing to fixate on. How about the idea instead that top athletes would be rewarded for their achievements at the White House with artery-clogging, high-cholesterol “hamberders,” along other assorted greasy gut-bombs? Isn’t that more worthy of jeers? And no matter how much Trump would spin it, I assure you, this is not fake news. Now pass me a Beyond Burger. Marla Rose is co-founder of Vegan Street Media and packs a mean snowball in Chicago.